Home » » VIDEO: DSS, Guards Brigade Storm MTN Mast Mounted By Anti-Buhari Protester. VIDEO: DSS, Guards Brigade Storm MTN Mast Mounted By Anti-Buhari Protester. 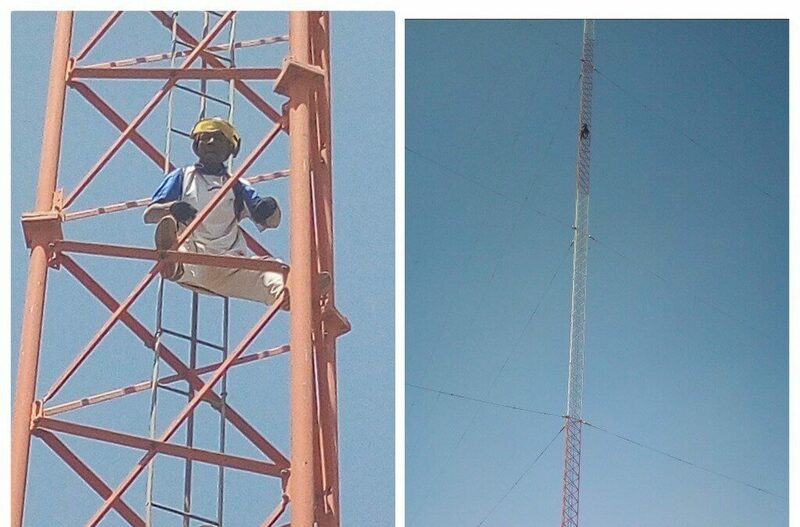 Operatives of the Presidential Guards Brigade are said to have arrived at an MTN mast in Asokoro, Abuja, where a 26-year-old man has climbed to the top to protest “bad governance” under President Muhammadu Buhari’s administration. THE WHISTLER had reported how the undergraduate of the National Open University of Nigeria (NOUN), Nura Iliyasu, mounted the said mast on Wednesday to begin a seven-day hunger strike against “another season of dashed hopes” allegedly occasioned by the emergence of the current administration. The Guards Brigade, a special arm of the Nigerian Army responsible for the President’s security, dispersed onlookers who gathered to watch Iliyasu. The 26-year-old northerner is said to be currently overlooking the Presidential Villa from the top of the MTN mast. It was gathered that operatives of the Department of State Services (DSS) have equally taken strategic locations around the mast where Iliyasu is observing his one-man protest. The young Nigerian had accused the current administration of the All Progressives Congress (APC) of subjecting the citizens to a “battered and mutilated economy, spearheaded by devalued Nigerian currency comparative to the United States dollar and other foreign currencies; affront, total and disobedience to the rule of law with impunity, thereby rubbishing judicial independence, checks and balances as enshrined in Nigeria’s Constitution; uneven and selective war against corruption as amplified by the political stigmatisation and prosecution of political opposition under the aegis‎ of anti-corruption. He had said, “life today in Nigeria is evidently not dissimilar to the Hobbesian State of nature in which ‘life is too nasty, brutish and short,” adding that, “hyperinflation is strangulating our people, starvation is prematurely snuffing life out of our people; deprivation and hopelessness is stagnating our youth progress from achieving the perennial slogan of leaders of tomorrow.